I wake up at 4:30 AM with my husband. Why? I have to physically and mentally prepare for my three little ones. And I like to write. I didn’t sleep for seven months. (Well, if you want to count the nine months of hellish twin pregnancy, I didn’t sleep for almost a year and a half.) I was completely delirious. I was about to crack. Even though the babies slept well for newborns, as any mother of multiples can tell you, their night feedings didn’t match up…and I slept about two (non-consecutive) hours a night. After my twins finished nursing and then we cried-it-out at seven months, they started sleeping through the night. They have slept from 7PM to 7AM very reliably ever since. It took me about a year after that to catch up enough on sleep that I didn’t feel fearful every night when I lay down my sweet head. My husband, like all commuters in our area, leaves for work before dawn to beat the traffic. (Not sure how that works, exactly, since they all do it…) He reasoned that my whole day would go more smoothly if I woke up with him and had some alone time before the kids woke up. Even though my husband was right, my job as a stay-at-home mom of three kids in diapers was incredibly physically demanding/ exhausting. And even though I was sleeping through the night, I was still completely brain-dead from the damage caused by the newborn phase. It took me a good year until I was ready to try to wake up early with my commuter husband. I know I am not reinventing the wheel here. Many of my mom friends have paved this road before me. One of my best friends, who happens to have five children, sets her alarm for 6:30 every morning because she doesn’t want her many little girls to see her putting on makeup. They were starting to primp and preen and she wanted to cut back on being that kind of example. Another friend of mine, who has four children, sets her alarm for 4:30 AM, but, instead of playing on Facebook like I do, she does all her house chores and even starts dinner in the crock pot. She says that is the only choice she has if she wants to get things done. Wow. One day, I was ready. (Ready to try to take a shower and blog – not mop the floor.) I surprised my husband when I said, “Honey, wake me up when you leave.” And, thus, you see, the title of this blog post is a semi-fib, because he actually wakes me up at 5:15 AM, when he leaves. But I figured it was kind of true that I woke up at 4:30 since I usually hear his alarm. It sucked. But only for about five minutes. I didn’t expect the benefits to be immediate! After my lovely shower, I took time to blow-dry my hair. Well, that was a mistake. That woke up the children. And THAT was a long day. Ok, I started over on Day 2. Relaxed wake-up, thorough and pleasant shower, and, yep, wet hair in a ponytail just like every other day. No blow-dryer. My favorite chair in the house does not allow children, unless we read scriptures together in it (which we do sometimes before the twins wake up). I settled in to my big papasan chair in my bedroom. This chair was a birthday gift from my husband, who knew I always wanted one. And I never sat in it, because, well, I never sat down. Now it was time to put it to work. My first rule for myself is that I have to read at least one chapter from my scriptures before I check any emails or social media. (That was the rule I gave myself during nighttime breastfeeding, and it worked so well for me… until I quit nursing!) As a Latter-day Saint (LDS/Mormon), we are encouraged to read our scriptures daily. We are well-versed in scriptures in our church, but we are to read and study daily to gain spiritual strength for the day. I can tell you that it works. My life feels like a careening train, or sometimes a raw exposed nerve, on the days that I don’t read my scriptures, and that has been true for me ever since I was in high school. I feel immediate peace as I settle in to read my familiar books of scripture. I gain strength for my day. I gain the ability to be a more patient mother for their day. After my study, it is time to play. I check email, I actually respond to email, read through my Facebook Newsfeed, read the real news, check my blog stats, and giggle and/or feel horrified at the search engine terms that lead people to my blog. I check the weather, and cry if it’s going to be too rainy/cold/hot/pollen-y to play outside that day. After all the social media, if the children are still quiet, I start to write. I love to write. My handwritten journals that I kept for years are a thing of the past. They are precious to me, but I can’t bring myself to read them. I have so many of them… and they are mostly all way too much teenage maudlin heart or too much grown-up infertility pain. I keep them closed. Now I write for my children on this blog. 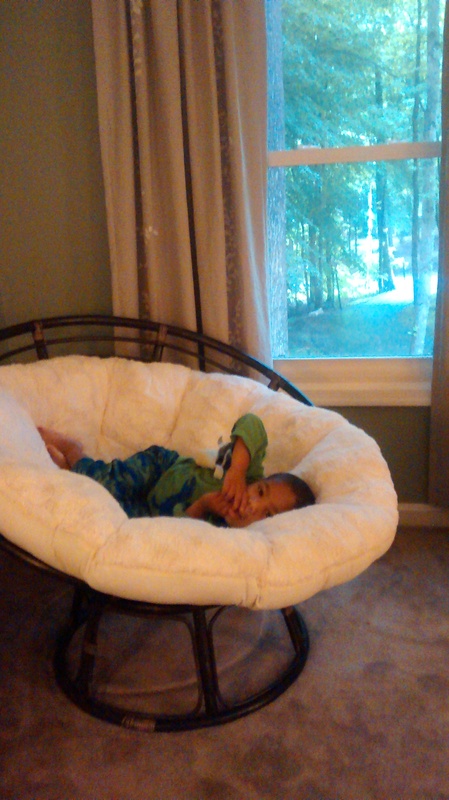 And it’s mostly done before they wake up, here in my favorite non-child-friendly papasan chair. When the children start to cry, or stir, or treat their crib as a trampoline, or do their pterodactyl shriek of joy (“WHAT DO YOU MEAN I HAVE A TWIN AND HE IS STILL HERE BESIDE ME IN THAT CRIB?! !”), I am ready. Instead of feeling a sense of urgency and dread, I am ready. I’m ready for them. I’m ready for the poop and the pee-soaked jammies. I’m ready for the whining. I’m ready for the day. I’m ready to focus on them. I’m ready to be less anxious. I’m ready to be more patient. I go into their pee-smelling rooms with a smile on my face. I’m ready. Dang it. It’s 6:05 AM and I just finished editing this article and a baby cried. Of course! The moment I pat myself on the back a little bit, they decide to wake up an hour early to make us all miserable. I shouldn’t have said anything. ← 100 Happy Days? Pfft. How about 10? I’ve very recently taken up blogging when my oldest started school, and I also choose to get up much sooner than the kids. It actually feels like a little bit of heaven to have some peace and quiet to start the day. Haha! Heaven for sure! Enjoy those mornings for all you can. We’ll be awake together!